Pomegranate - *High Oleic Expeller Pressed Safflower (Carthamus tinctorius) Oil, High Oleic Expeller Pressed Sunflower Seed (Helianthus annuus) Oil, Castor (Ricinus communis) Oil, *Calendula (Calendula officinalis) Flower, *Olive (Olea europaea) Oil, *Grapeseed (Vitis viniferia) Oil, *Expeller Pressed Apricot Kernel (Prunus armeniaca) Oil, Vitamin E (Tocopherol), *Cocoa (Theobroma cacao) Butter, *Shea (Butyrospermum parkii) Butter, Candelilla (Euphorbia cerifera) Wax, Bees (Cera alba) Wax, Stevia (Eupatorium rebaudianum bertoni), Pomegranate (Punica granatum) Extract. 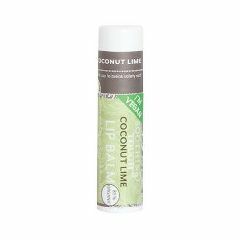 Coconut Lime - *High Oleic Expeller Pressed Safflower (Carthamus tinctorius) Oil, High Oleic Expeller Pressed Sunflower Seed (Helianthus annuus) Oil, Castor (Ricinus communis) Oil, *Calendula (Calendula officinalis) Flower, *Olive (Olea europaea) Oil, *Grapeseed (Vitis viniferia) Oil, *Expeller Pressed Apricot Kernel (Prunus armeniaca) Oil, Vitamin E (Tocopherol), *Cocoa (Theobroma cacao) Butter, *Shea (Butyrospermum parkii) Butter, Candelilla (Euphorbia cerifera) Wax, Coconut (Cocos nucifera) Oil, Bees (Cera alba) Wax, Stevia (Eupatorium rebaudianum bertoni), Lime (Citrus aurantifolia) Essential Oil. Peppermint - *High Oleic Expeller Pressed Safflower (Carthamus tinctorius) Oil, High Oleic Expeller Pressed Sunflower Seed (Helianthus annuus) Oil, Castor (Ricinus communis) Oil, *Calendula (Calendula officinalis) Flower, *Olive (Olea europaea) Oil, *Grapeseed (Vitis viniferia) Oil, *Expeller Pressed Apricot Kernel (Prunus armeniaca) Oil, Vitamin E (Tocopherol), *Cocoa (Theobroma cacao) Butter, *Shea (Butyrospermum parkii) Butter, Candelilla (Euphorbia cerifera) Wax, Bees (Cera alba) Wax, Stevia (Eupatorium rebaudianum bertoni), Peppermint (Mentha piperita) Essential Oil. Tea Tree Lemongrass - *High Oleic Expeller Pressed Safflower (Carthamus tinctorius) Oil, High Oleic Expeller Pressed Sunflower Seed (Helianthus annuus) Oil, Castor (Ricinus communis) Oil, *Calendula (Calendula officinalis) Flower, *Olive (Olea europaea) Oil, *Grapeseed (Vitis viniferia) Oil, *Expeller Pressed Apricot Kernel (Prunus armeniaca) Oil, Vitamin E (Tocopherol), *Cocoa (Theobroma cacao) Butter, *Shea (Butyrospermum parkii) Butter, Candelilla (Euphorbia cerifera) Wax, Bees (Cera alba) Wax, Stevia (Eupatorium rebaudianum bertoni), Tea Tree (Melaleuca alternifolia) Essential Oil, Lemongrass (Cymbopogon schoenanthus) Essential Oil. Raspberry - *High Oleic Expeller Pressed Safflower (Carthamus tinctorius) Oil, High Oleic Expeller Pressed Sunflower Seed (Helianthus annuus) Oil, Castor (Ricinus communis) Oil, *Calendula (Calendula officinalis) Flower, *Olive (Olea europaea) Oil, *Grapeseed (Vitis viniferia) Oil, *Expeller Pressed Apricot Kernel (Prunus armeniaca) Oil, Vitamin E (Tocopherol), *Cocoa (Theobroma cacao) Butter, *Shea (Butyrospermum parkii) Butter, Candelilla (Euphorbia cerifera) Wax, Bees (Cera alba) Wax, Stevia (Eupatorium rebaudianum bertoni), Raspberry (Rubus idaeus) Extract.